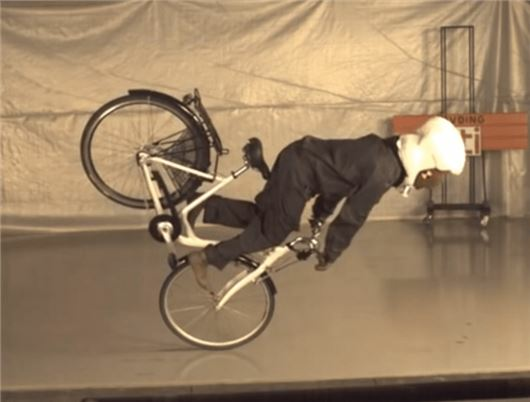 An airbag helmet for cyclists has been developed by Swedish inventors, Anna Haupt and Terese Alstin. The Hövding helmet inflates in a tenth of a second and contains sensors that detect abnormal movements to inflate the airbag prior to impact. Unlike standard helmets, the Hövding is not placed on the head, but as a collar around the neck, which inflates and protects the head in the event of an accident. The device costs £335 and has been cleared by European safety standard regulators. The Hövding helmet can be customised with exterior patterns and is waterproof. It is also sold with a rechargeable battery. Sound like something from the future? Why not check out the video below to see the Hövding in action.